This collection of grosgrain ribbons are just fantastic! 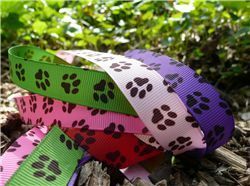 Chocolate paw prints printed onto coloured 15mm grosgrain ribbon. Dog, cat or panda paws!! Perfect for any animal project.